Heat oven to 350°F. Microwave bacon as directed on package or until crisp; drain on paper towels. Crumble; set aside. Separate dough from 1 can into 4 rectangles. Place 2 inches apart on large nonstick cookie sheet; firmly press perforations to seal. Arrange turkey over rectangles to within 1/2 inch of edges. 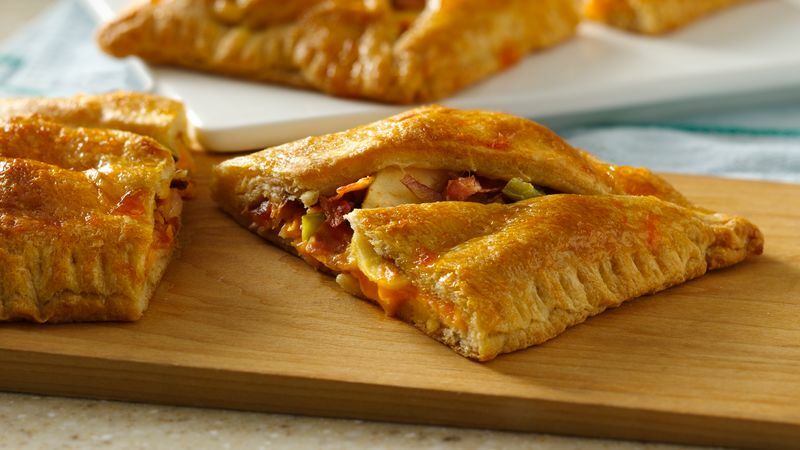 Top each with jalapeños, cheese, apple slices and bacon. Separate remaining can of dough into 4 rectangles. Firmly press corners to seal, leaving center open. Place over filled rectangles; with fork, press edges to seal. In small microwavable bowl, microwave preserves on High 25 to 30 seconds or until melted; brush over dough. Bake 20 to 24 minutes or until deep golden brown. Cut in half to serve.